STEVE Ashton “thrashed” title contender Anthony Rice in the first frame of a 3-2 defeat in the Cuestars South Wilts Snooker League. His 22-year-old opponent from Fordingbridge did not pot a single ball in the opener at Salisbury Snooker Club. Ashton won it by 80 points to four – and the four was a foul! But Rice responded with a 79 break to square the match and went on to win a fifth-frame decider. “In all, it was a very enjoyable encounter,” said Ashton, 56. Rice added: “It was one of the better matches of the season for me. “I genuinely did not have a pot to look at in the first frame. Steve didn’t seem to miss, and when he ran out of position his safety always left me in trouble.! “It was probably Steve’s strong start that woke me up. Eddie Mason insisted Paul Burt “thoroughly deserved” his 5-0 victory despite two fairly close frames. And league leader Jake Stewart posted a 53 break in a 3-2 victory over Callum McDonald. 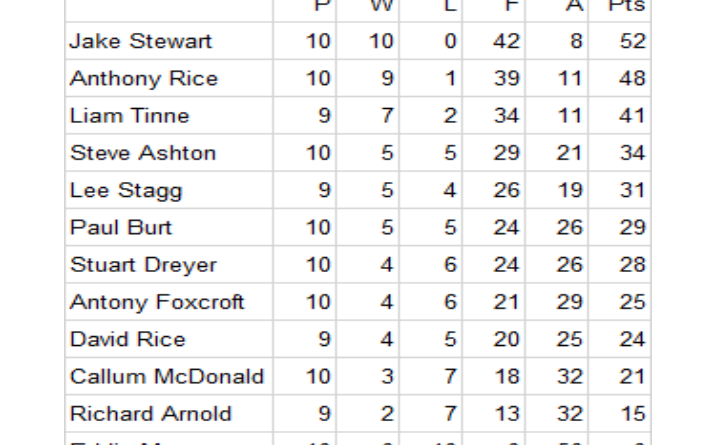 It means Stewart needs to win two frames in his final match against Lee Stagg to guarantee a first South Wilts title. Results: Jake Stewart 3-2 Callum McDonald, Steve Ashton 2-3 Anthony Rice, Eddie Mason 0-5 Paul Burt, Stuart Dreyer P-P Lee Stagg, David Rice P-P Liam Tinne.